The Basic Shoe Shoe Shine Kit in wooden boxes are 11" X 8" X 5 1/2" with a footrest on the top and feet on the bottom. The tops are hinged at the back for easy access and have a latch in the front. The pine box has a red mahogany stain and a clear lacquer finish. These boxes are made exclusively for The Shoe Shine Kit with plenty of room for your supplies. Two applicator brushes. 100% Horse hair also, and one light and one black. For Free Initial Plate, a $10.00 value, enter first, middle, and last initial in that order. If you would like to switch out the polish colors let me know in the "Comment" section of the order page and we can do that for you. 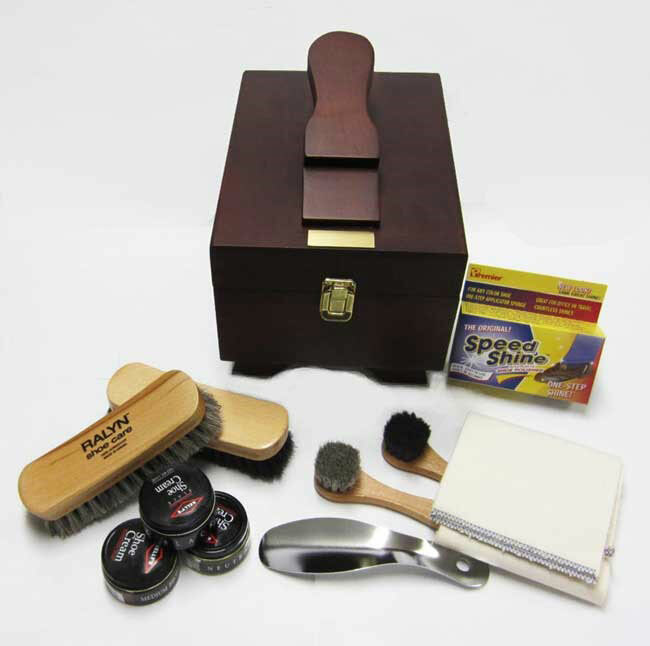 These are quality shoe shine kits that make it easy to take care of your shoes and give them a brilliant shine. "Keep Shining" with your personalize shoe shine kit.